Thick, vibrant, brightly coloured, viscous paint, sparkling, shimmering and reflecting light, both from its surface and from its subject. Like from pools of oil, or petrol in a puddle, thousands of tiny rainbows are refracted. Suns and stars, burning and emitting heat, bright against the night sky. Yet the threat of meltdown looms, fragility and ethereality, drops of water amidst the oil causing it to disperse. We’re in the heart of the City and looking at a giant heart-shaped diamond – the centenary diamond – on an immense 2×3 metre canvas. Let Me Hear You Say The Words I Want To Hear. It’s a new work by award winning painter Paula MacArthur (she won the John Player Portrait Award – now the BP Portrait Award – before even finishing her foundation course and later also won a prize in the John Moores competition). 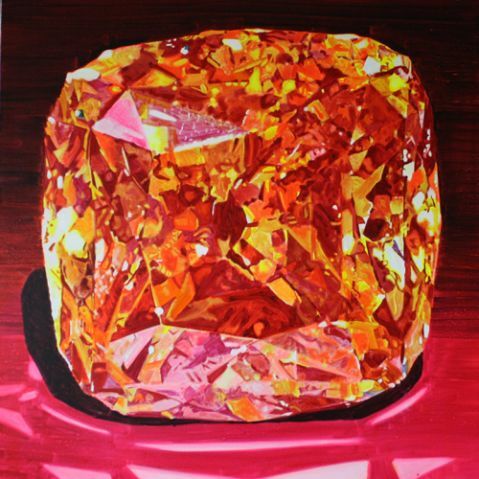 Originally a portrait painter, MacArthur has been working with gemstones for a couple of years now, since a visit to the collection at the Natural History Museum for her 15th (crystal) wedding anniversary. Inspired, she painted a watercolour of 15 stones from found images, and, from there, from the initial romantic personal gesture, things grew. Literally. Speaking of her large-scale canvases, MacArthur says: ‘It suddenly felt that that was the size they needed to be. The scale worked for me, with the size of the brush marks.’ Indeed, it is about brush marks and painterly gesture, as much as it is about romance, and as much as it is about precision. There are two stages to MacArthur’s travails. First, she spends time flicking through images – all of the gemstones in the Natural History Museum collection are photographed – and then, every so often, one will catch her eye. Working with her own photograph, she then ‘messes about’ on photoshop. Often there are elements in the photograph which don’t really belong – floating highlights in the background or flaring effects – ‘I’m not a great photographer,’ she confesses, and ‘they’re very difficult things to photograph because the light changes in a millisecond.’ But each of these elements adds something to the overall composition. Next, it’s a question of colour. Here, MacArthur becomes excited: ‘It’s the colour that’s the important thing for me in the first place and I just want to ramp it up. These are excessive objects on so many different levels, that’s just saying “More!” really. It’s always the colour that’s the hook.’ And so she puts the colour slider up to 100% saturation – and continues to exaggerate the colour throughout the process, in the painting too, by mixing in lots of linseed oil to make it really rich. Once the design part has been completed – a process which takes about a day – MacArthur flips into a different mode and is ready to begin to paint. ‘[Now] it is about constructing it, it is about the craft, it is about enjoying the process. 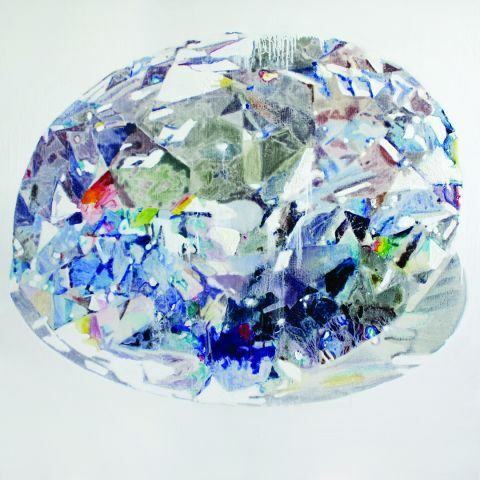 It becomes quite spontaneous and instinctive and kind of meditative.’ Working with an A4 printed image, she uses an overhead projector to lightly draw an outline of the gemstone on the canvas – ‘because they do need to be symmetrical’. Nevertheless, the projector distorts, and so she ends up redrawing quite a lot as she works through. The facets of the stone become like a grid and MacArthur treats each facet like a little painting in its own right, as she works systematically across the canvas, thinking about layers of colour. Cyan, magenta, yellow and key. A recent foray into screen printing has led her to think much more in these terms. since you can’t buy fluorescent oil paint. ‘It looks like icing sugar!’ she says. ‘It makes your eyes hurt! It’s fantastic stuff!’ What she likes best is that the undiluted colour has spilled round on to the edges of the canvases, from where it reflects on to the wall, giving a neon glow – or halo – around the works. And then there are the drips. These came about after MacArthur took an extended break from painting to get married and have children. Having begun her career as something of a purist, trained at the Royal Academy and described even by Brian Sewell (in an otherwise positive review of her John Player Portrait Award portrait) as ‘irredeemably brown’, MacArthur began, in the early 2000s, a series of Memphis works – ‘lots of Americana, basically.’ She was working on a large painting of Elvis Presley’s favourite gun – again, all about excess – when, before leaving her studio one day, she painted the background red. When she came back the next morning, the whole thing had slipped on to the floor. ‘It looked like there’d been a murder!’ Wanting it really glossy, she’d added lots of linseed oil and turps – clearly too much for the canvas to hold. But, amidst the mess, what was left behind was a magenta glaze which MacArthur really liked, and so she started to experiment. ‘It’s a dangerous thing,’ she says, ‘because it can start to look quite contrived. It’s a fine line as to what you allow.’ In Let Me Hear You Say The Words I Want To Hear, for example, lots of the drips have been painted out. ‘It becomes quite fragile with the drips and sliding paint,’ MacArthur continues. ‘It seems aggressive, but it’s also fragile – quite a nice metaphor for a relationship, in fact, something which could just slip away. It is all about relationships and love, really, and what that represents. But there are so many different layers of association with gemstones that I am also feeding on.’ These include wealth and capitalism, which become especially relevant when the works are being shown in the city. On the surface, from afar, the stones look valuable and perfect, but on closer inspection, maybe there is a fracture or a scratch. Similarly, with MacArthur’s paintings, from a distance, they can look almost photorealistic, but, as you move closer, they become something completely abstract. The focus moves from the gemstone to the physicality of the paint. ‘I think the paintings invite you to come and look at the surface. But, as you try to approach them and attain them, it all just disintegrates, and it becomes what it really is – the paint and the marks. And I really enjoy that.’ Metaphorically, it’s just taking something – a jewel or a relationship – and putting it under a magnifying glass. Hence the role of the questioning titles, all except for one of which are lyrics from love songs (the exception being Of Course I Still Love You which is the name of an Iain Banks spaceship). In Everything I’ve Had But Couldn’t Keep, for example, the drips and rivulets, the streaks of light, rather reminiscent of a Klimt painting, really fit the title, reflecting the idea of everything just slipping, sliding and melting away. Tell Me Love Is Real – a bright orange twinkling sun – takes its name from a lyric in the song to which MacArthur had her first dance at her wedding. Even this, however, is an insecure, questioning statement. ‘They’re about my deep seated insecurity,’ says MacArthur, referring both to the titles and the works themselves. ‘But I think everyone struggles with that. They’re about the strength of passion against that fragility and neediness. Hopefully some of that comes through the paint. They’re quite big and bold and in your face. Loud and proud. But, actually, they’re quite delicate. They’re tiny things.’ Metaphor and reality melt together, just like the paint, oil and glistening reflections. MacArthur herself has said it all – these works are loud and proud, almost photorealistic, stunningly so, wealth and splendour writ large. But they invite you in, at which point they disintegrate, become abstract, become about the paint, and then, as you move yet closer, they become about so much more – the titles, the inspirations, the hopes and fears and insecurities which plague us all. Such a tiny exquisite and valuable gemstone, magnified and shown large-scale with all its flaws, reflecting back the innermost facets of the artist and of the viewer.